Adobe has released the latest versions of its lower cost image and video editing Photoshop Elements and Premiere Elements software packages. 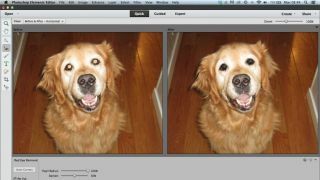 Photoshop Elements 12 adds a slew of effects, including the ability to fix 'red eye' caused when camera flash reflects in animals' peepers. Other features include simplified editing on mobile devices and 64-bit support to up performance on Macs. Premiere Elements 12 now includes a Guided Edit mode that takes you through creating and adding music to videos, with more than 50 built-in soundtracks and 250 sound effects on hand. You can download the Windows and Mac versions of Photoshop Elements 12 and Premiere Elements from Adobe's website now for £78.15 each (around US$124) (or £63.49 - around US$101) to upgrade from version 11). Both are available in a bundle for £117.22 (around US$187) (or £96.71 - around US$155 - to upgrade).